I certainly do have an avid interest in history. 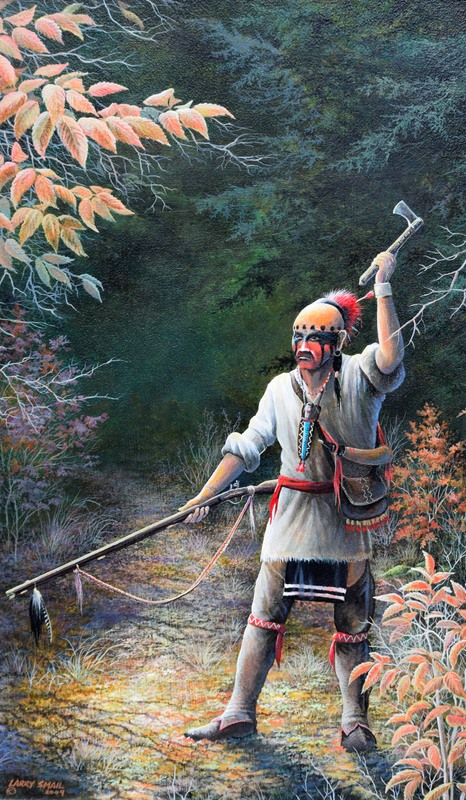 The French and Indian War years interest me a lot since many events of this era happened in Pennsylvania and within a few miles from where I grew up. The years for this war locally began in 1754 and lasted to 1758 when the French abandoned Fort Duquesne in present-day Pittsburgh, Pennsylvania allowing General Forbes to take over the fort. He renamed the fort to Fort Pitt. Within a mile from where I live is a community called Kittanning. During this war members, primarily, of the Lenni-lenape (Delaware) and Shawnee nations took up residence launching raids across Pennsylvania, Maryland and Virginia. 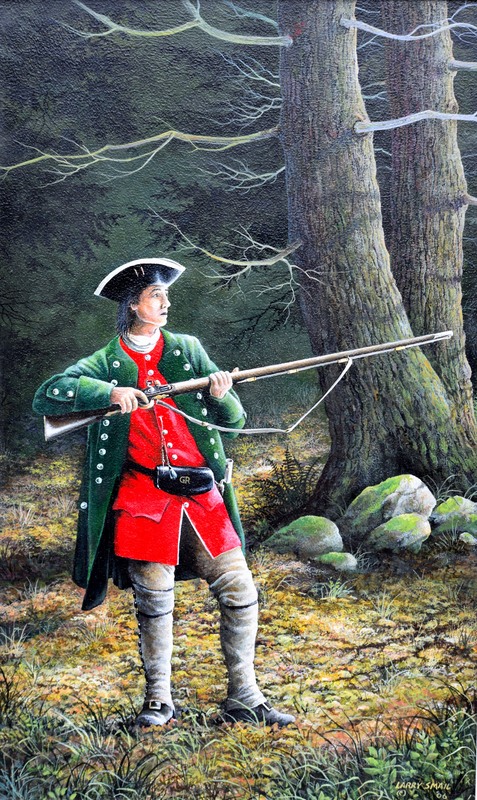 In September 1756, Lieutenant Colonel John Armstrong launched a raid upon Kit-Han-Ne. Mostly militia-style volunteers under Armstrong were involved in this attack. However, some Pennsylvania Provincial soldiers were involved. These soldiers would be dressed as shown in my painting called; IN DEFENSE. The Indians of the time were brave warriors. The painting shown here called: IN DEFIANCE, depicts a naïve warrior defying the soldier. Eastern Indians usually wore little into battle preferring to paint themselves to aid in terrorizing the enemy. However, as cooler weather approached clothing would be worn as needed. These paintings were created in 2004 and 2006. 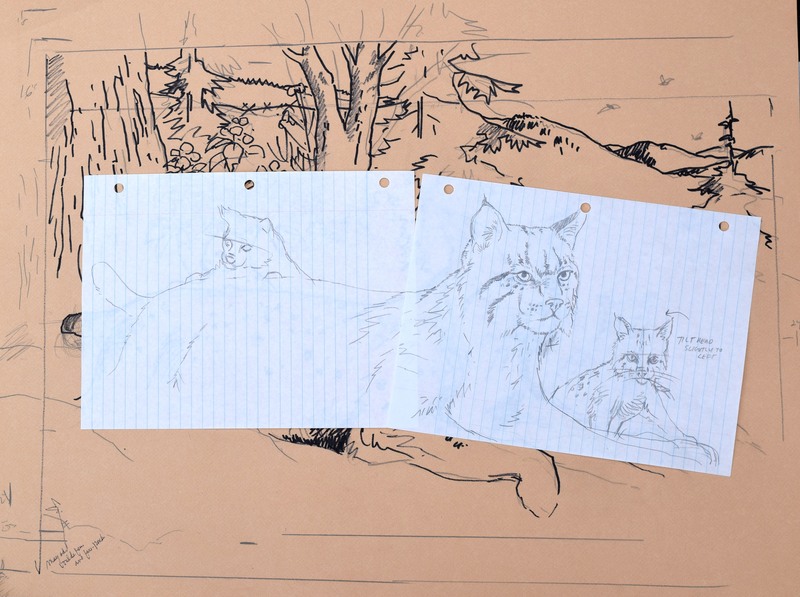 Original concept of reclining ‘cat. I felt this format was too crowded. turns from ideas to completed art. For this reason I am doing a blog entry to show some of the stages with explanatory text. 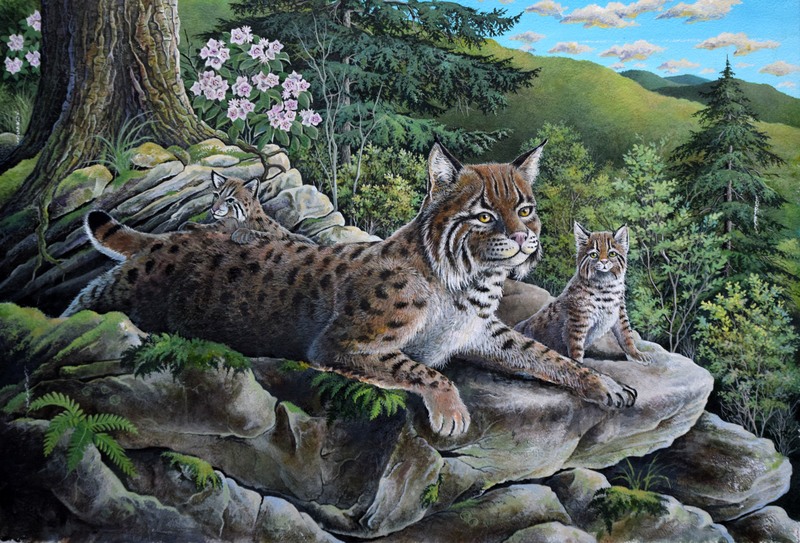 The idea for the painting, “Wykoff Run Bobcats“ came from a contest entry form I had received from the Pennsylvania Game Commission. 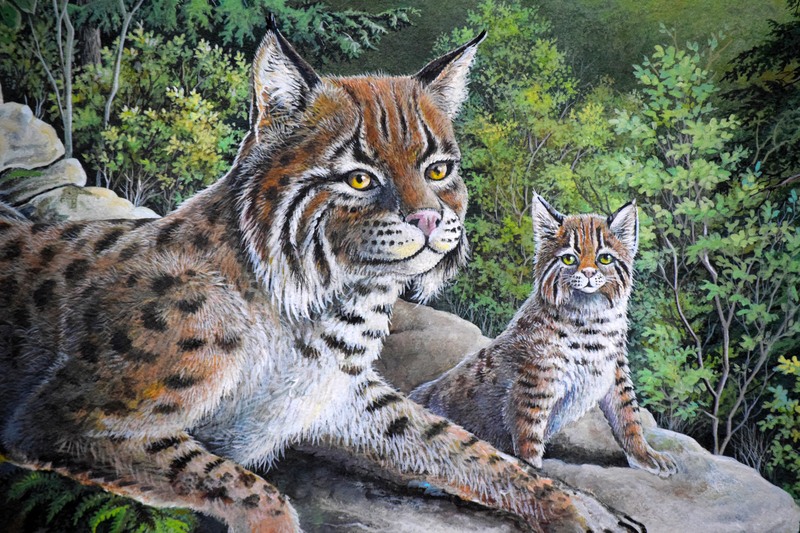 Their interest was to select a painting to add to their “Working Together For Wildlife” print series. 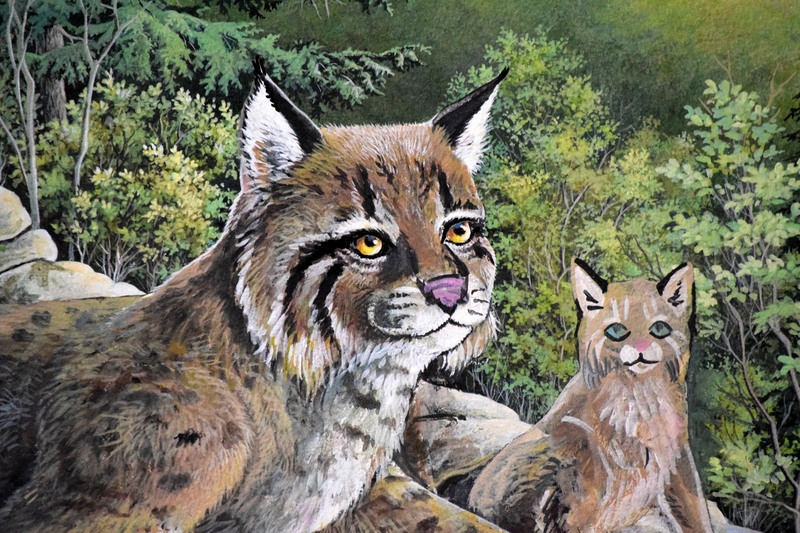 I imagine you may have figured our by this time the painting was to be a colored piece featuring a Bobcat or Bobcats. 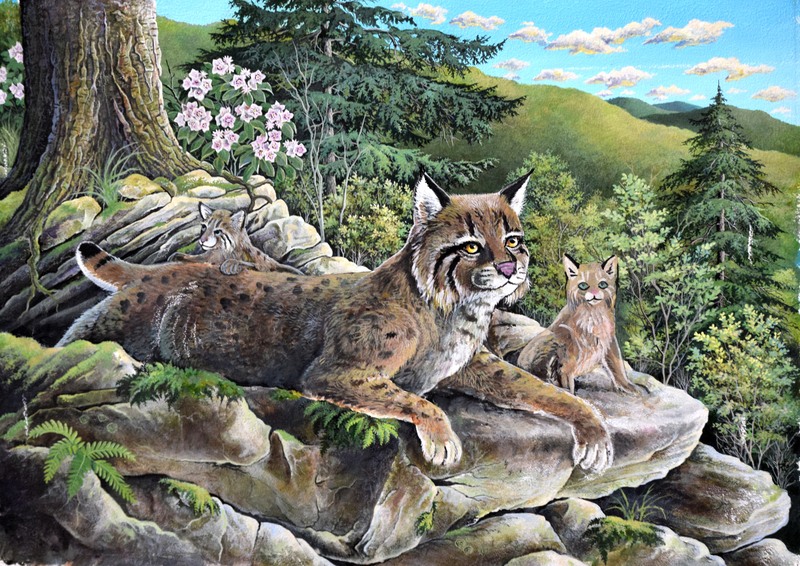 Bobcats are native to Pennsylvania and have been increasing in numbers in recent years. I am thankful for that fact. 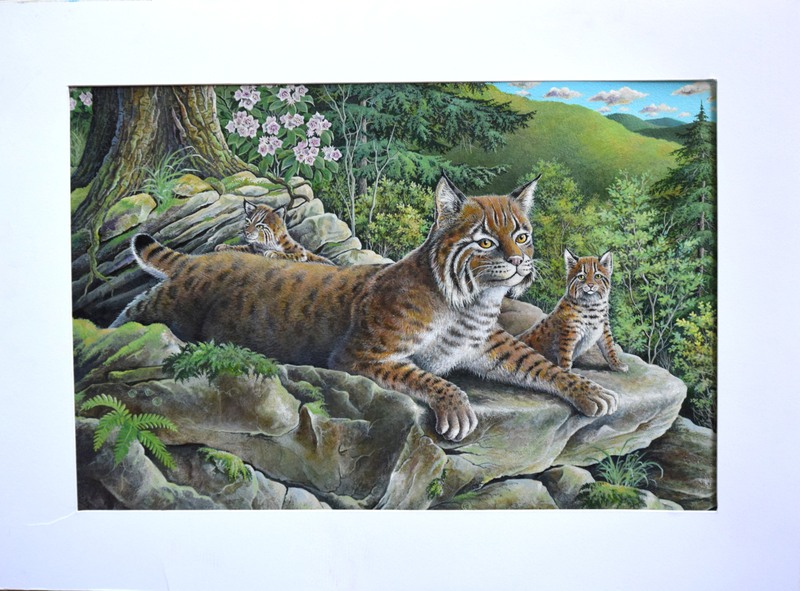 The wildlife prints are sold by the PGC. 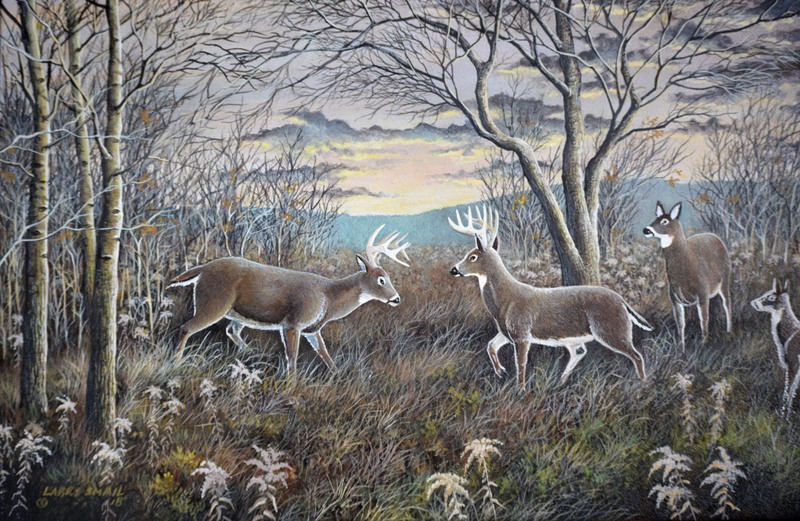 (Pennsylvania Game Commission) Proceeds from the sales of the prints go to wildlife research and management programs. Original reclining ‘cat on a horizontal format. At first I wasn’t thinking of doing a painting as an entry. 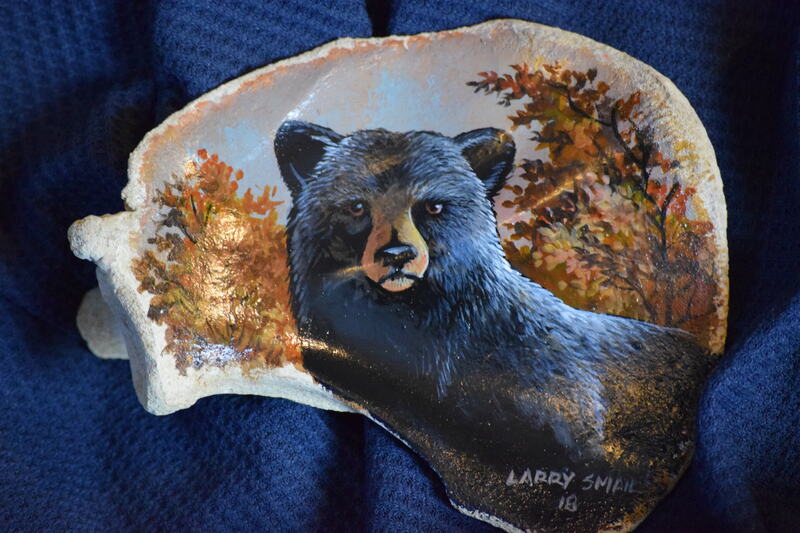 I do not attempt annually to do a painting, but I have entered some over the years. And I have actually placed with a few. Last year in 2017 I did a Snowy Owl but failed to win. seemed congested. 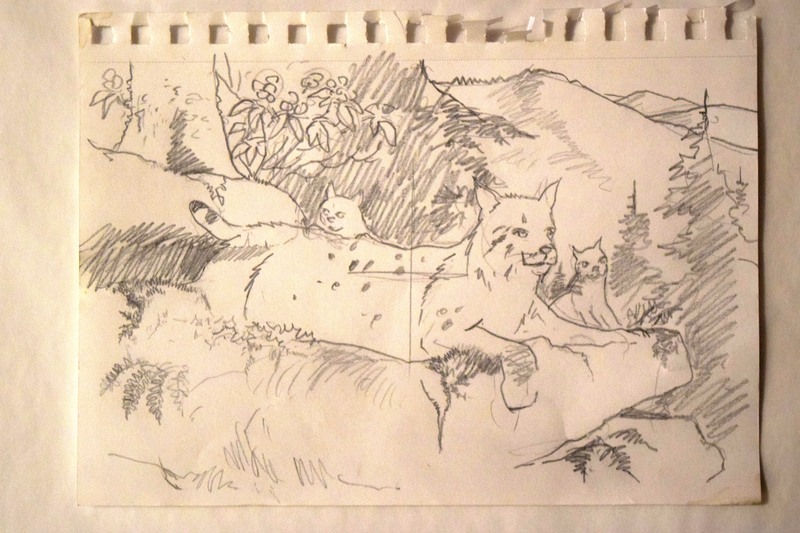 I rough sketched another reclining Bobcat on a horizontal format and I liked the way the sketch was going. 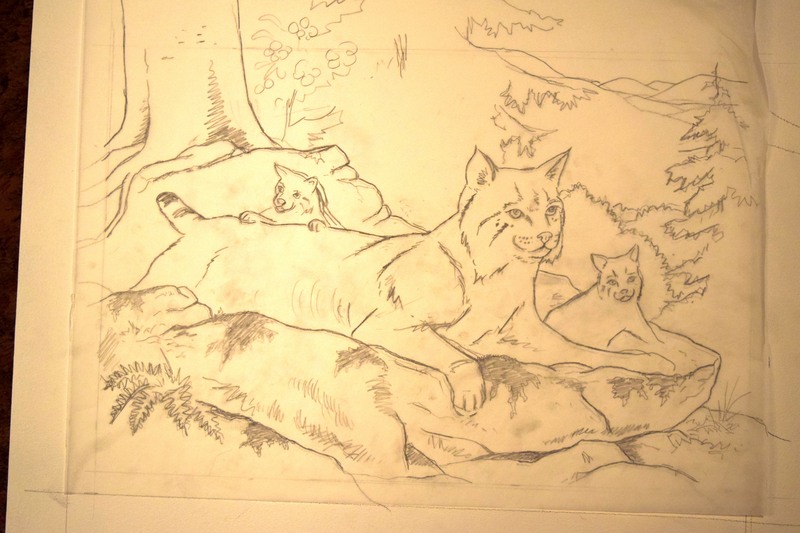 I roughed in two Bobcat kittens. 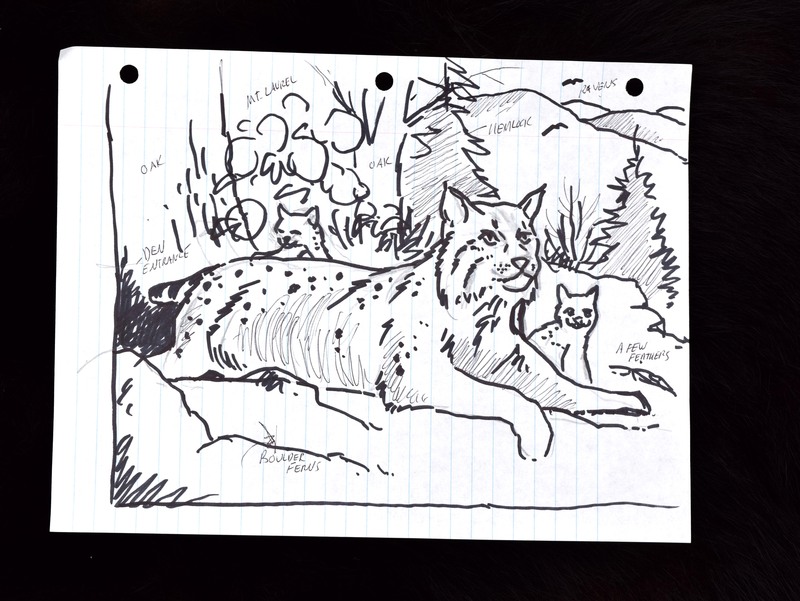 I laid a piece of notebook over the head of the Bobcat and fined-tuned the sketch some. I began thinking I may be onto something here. 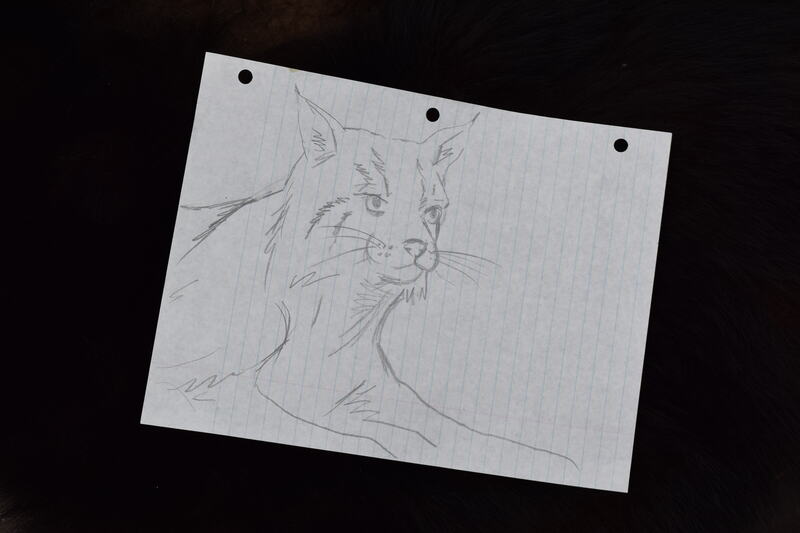 I placed another piece of notebook and traced through with details this time. I liked where this going. I added details with the two kittens. Later I changed the one kitten’s head with a slight inquisitive tilt. I liked that, too. I felt I was on the way to a completed painting now. Head tracing to begin detailing. A few days later I spent time hiking in the Wykoff Run area of the Moshannon State Forest near the Quehanna Highway. 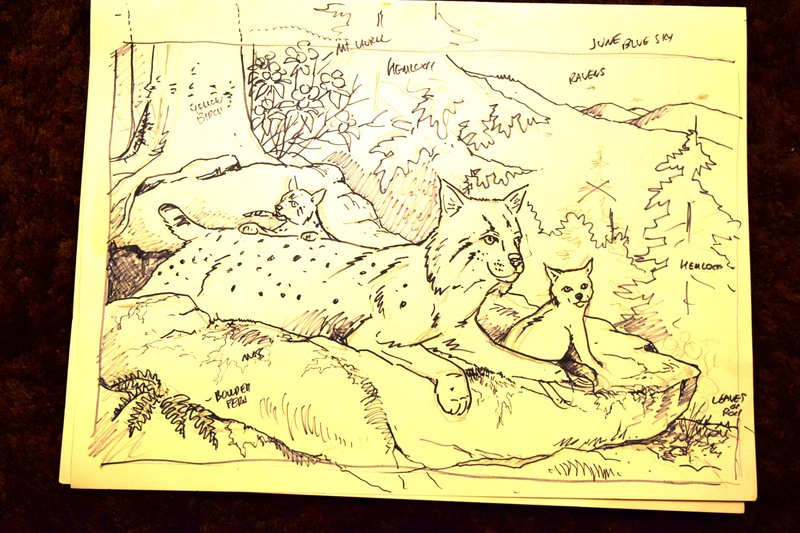 Besides hiking , photographing and fishing I was looking for additional inspiration and sketching opportunities to finalize the background thought process I had done with the original concept. Detailing features on notebook paper. would cover the extra painting. 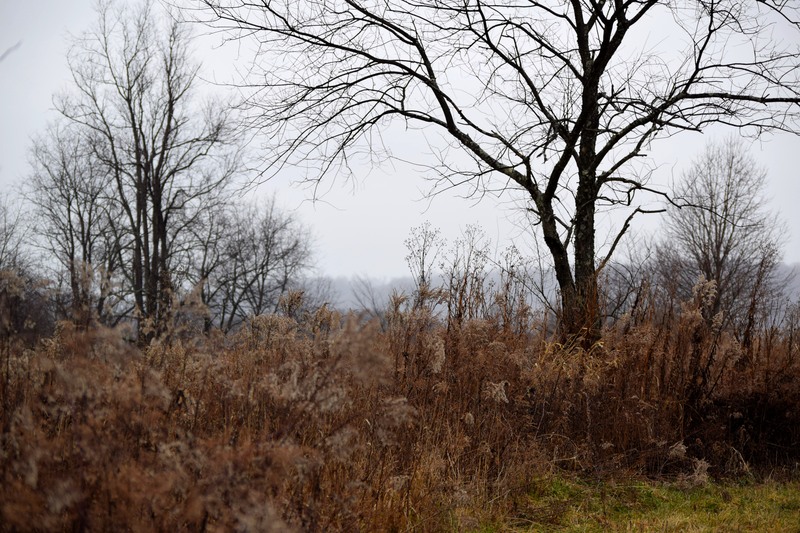 As stated, I spent two days in the Moshannon State Forest and Quehanna Wild Area. I studied many rocks. The area has places inundated with rocks from small to as big as a house. I had plenty of opportunities to look them over and the various vegetation that may be found on them. I made some sketches of rocks. Later the first day I made a quick sketch idea using previous thoughts and made another rendering to work with while at the jeep. 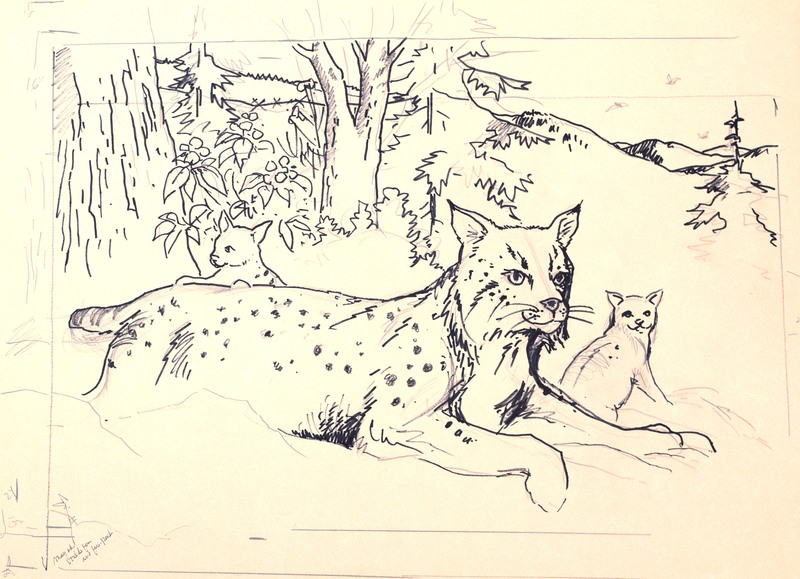 Note the changes from the earlier sketches concerning background. The rough drawing to size at the jeep. Now using tracing paper I traced over the drawing I made from the jeep after I came home. I cleaned-up the roughness and detailed shapes better. I am ready to transfer this rendering onto gessoed-covered Masonite. The painting is about to begin. The cleaned-up rendering ready to transfer. Image lightly transferred to a prepared panel. I began to paint on the panel. The style of painting I perform, at this time, I jokingly call the “slapping stage.” In simple terms of describing this stage I mix up some paint and rapidly slap the paint on. This, to me, establishes some form and depth to the early painting. The paint you see in this example was completed in one hour. I know this for I listened to two half hour interests on the computer. I may slap more on before settling down to serious detail work. Refinement of detail. This design has approximately 7 hours of painting time at this stage. 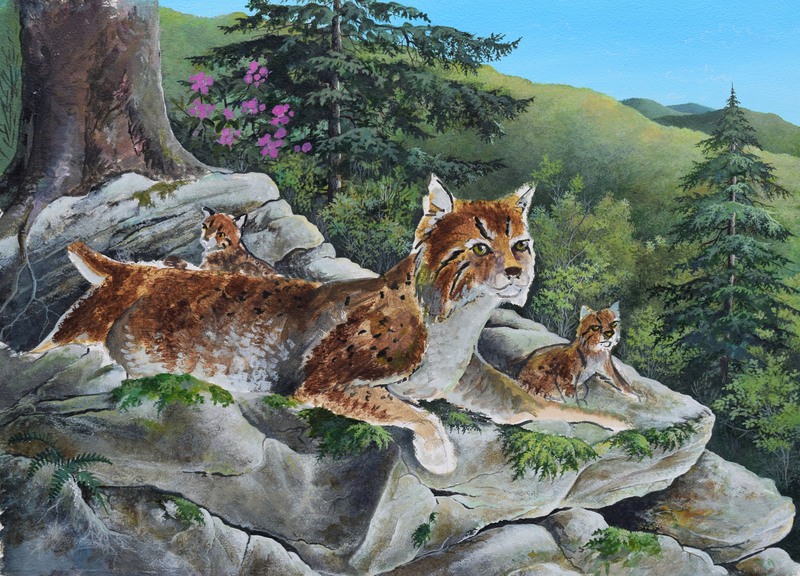 All of the background and rocks are close to 80% completed. I “slapped” more paint to get the feel of the cats. Background is about 90% complete. 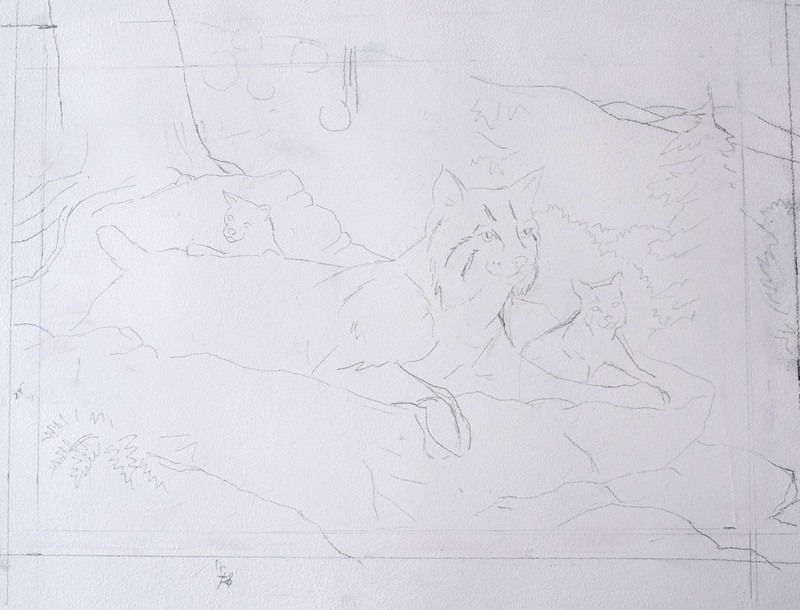 I have begun to detail the cats. Notice the kitten on right. I slapped some paint to make the kitten bigger. Detail of cats is about 20% done. 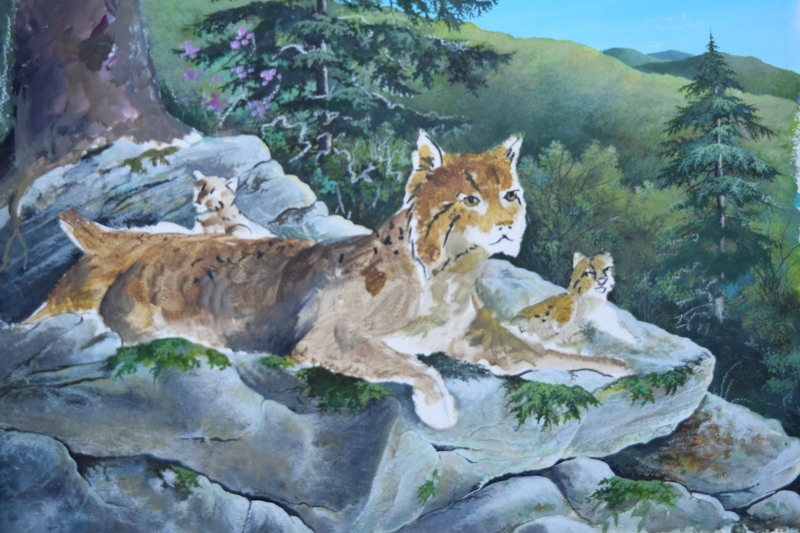 The following two photos of the painting shows more detail on the ‘cats. Note some changes on the females left leg. 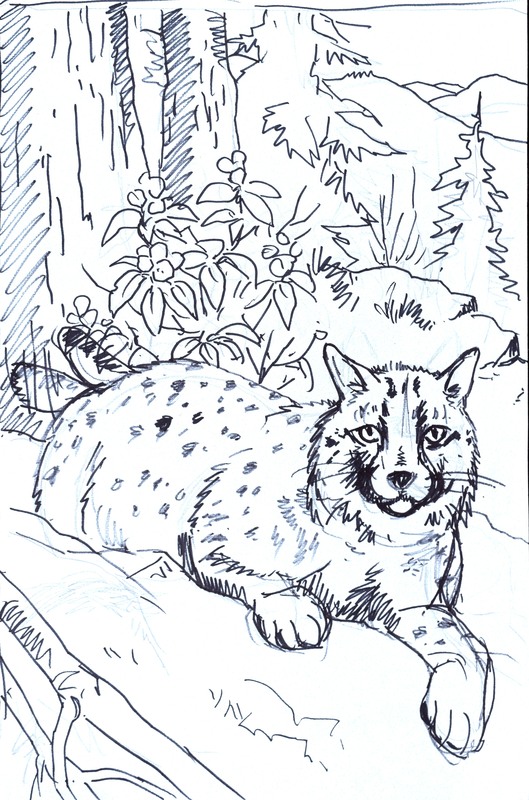 I wasn’t happy with the way the leg was so I changed it to allow her paw to dangle over the rock, too. Also, note that I completely changed the positioning on the one kitten. I realized something wasn’t feeling correct, so I roughed the kitten in as you can see in the photo. 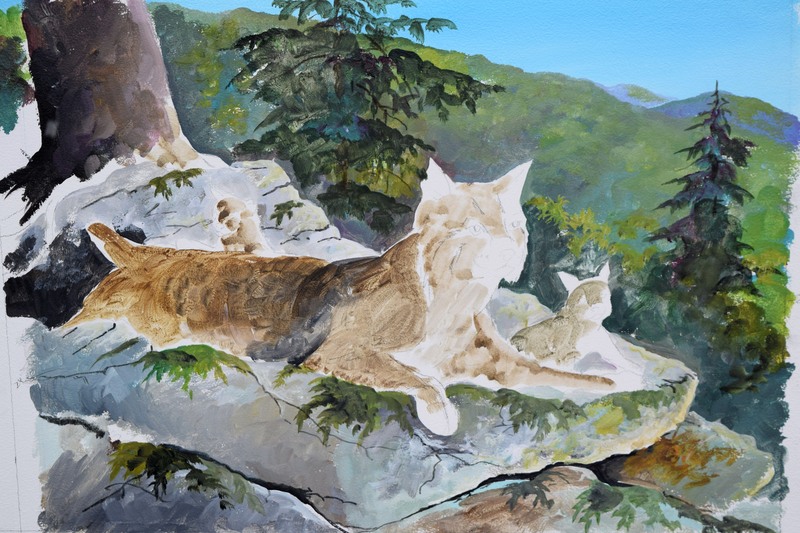 I suppose I still cluttered the art, but I guess I try to capture much into a painting as I see the wild. Redo rough on the kitten. 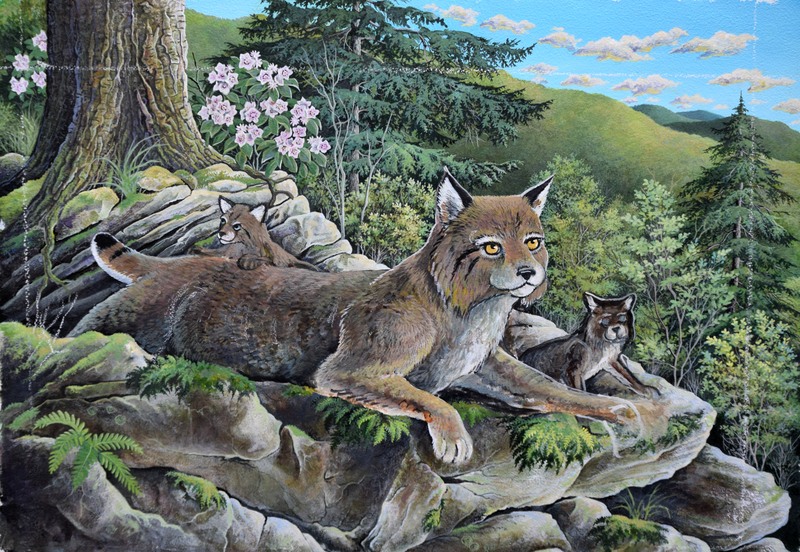 Detail on big bobcat is about 60% completed…maybe a little less. DETAIL WORK WELL ON THE WAY! More detail work and the kitten is almost done, but I see some probable changes. 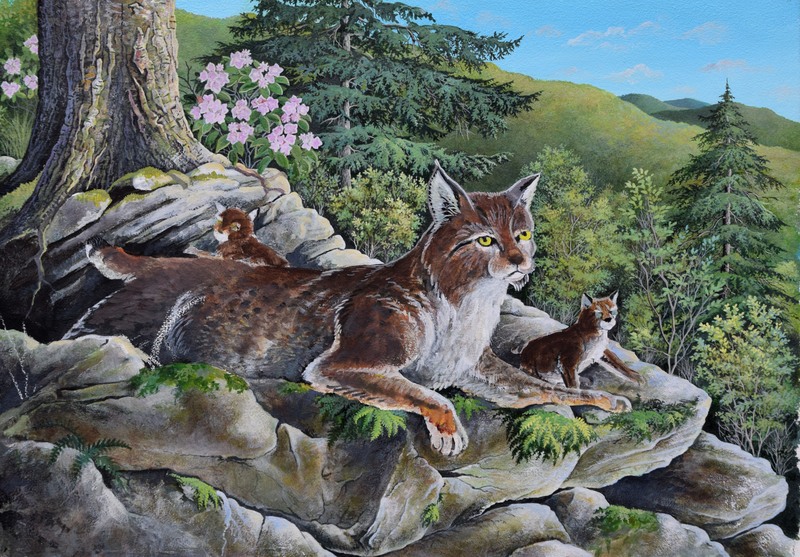 I changed the positioning of the left leg on the mother ‘cat. The painting matted to size. 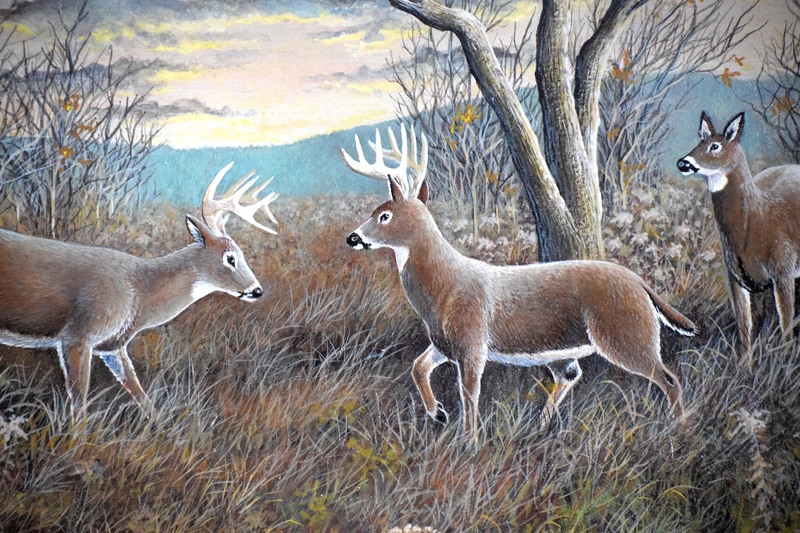 Start To Finish Painting…THE STAND OFF. Around Christmas I went for a walk-on a rainy day. The rain wasn’t a heavy or even moderate rain at the beginning. The moisture was light. 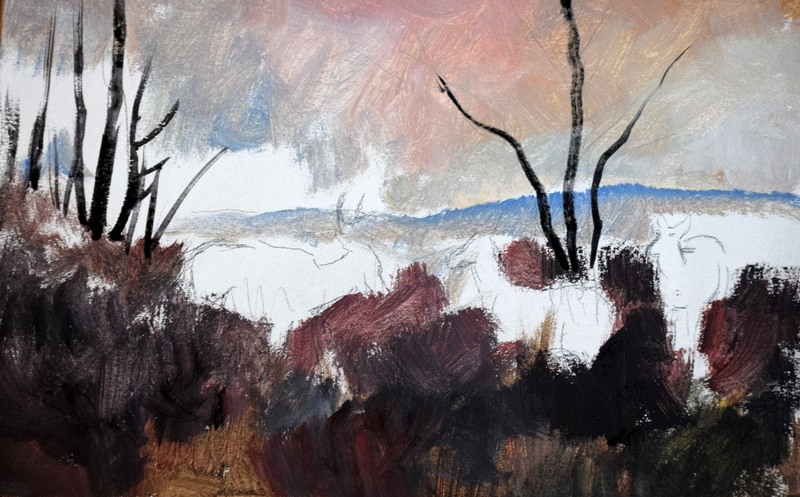 While walking I saw a landscape scene that immediately triggered an inspiration for a painting. The image wasn’t nothing spectacular as the photo here shows, but I saw potential as I snapped the photo. At the time of the photo the rain was increasing. 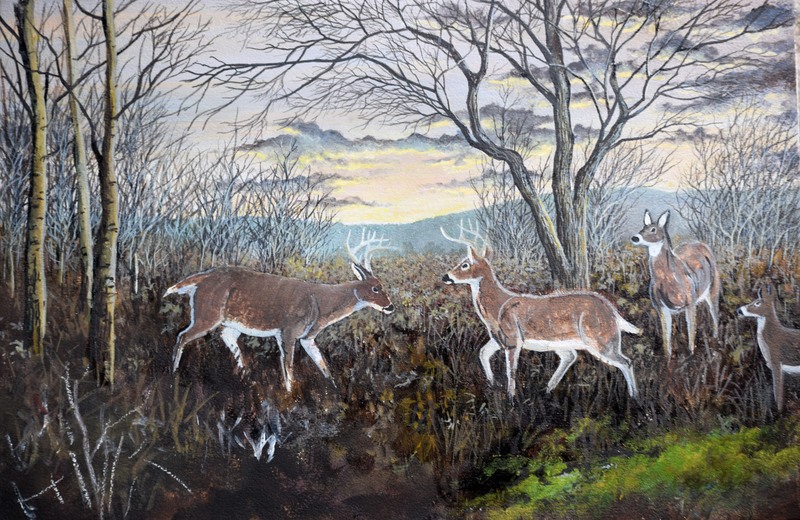 I quickly decided some deer would be the subject matter as I rapidly sketched the photo image onto a gesso-treated panel. I wasn’t concerned with a hundred percent copy of the photo as the pencil put into place some things. 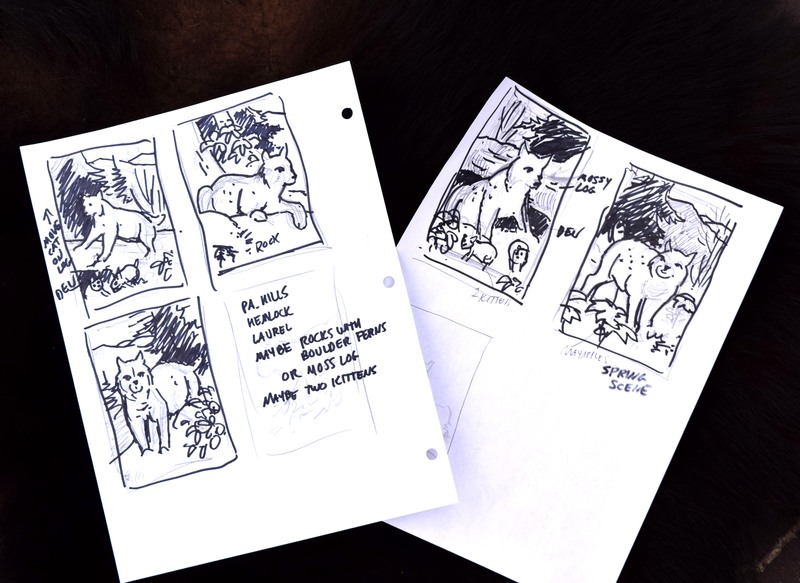 The trees and very rough drawing of deer is shown below. I began “slapping on” paint at this stage, too. I knew the painting would evolve as they always do for me. I very seldom do a replica of a photo in fact most paintings are creations from deep in the back of my brain area….yes, way back there! In other words they are made up! I included some stages on social media as many have told me how they enjoy watching the progress of a painting. You’ll see readily how this painting changed from the original photo and sketch. I included some Aspen trees and changed the sky dramatically from the gray rain clouds. Notice I altered the tree on the right some. 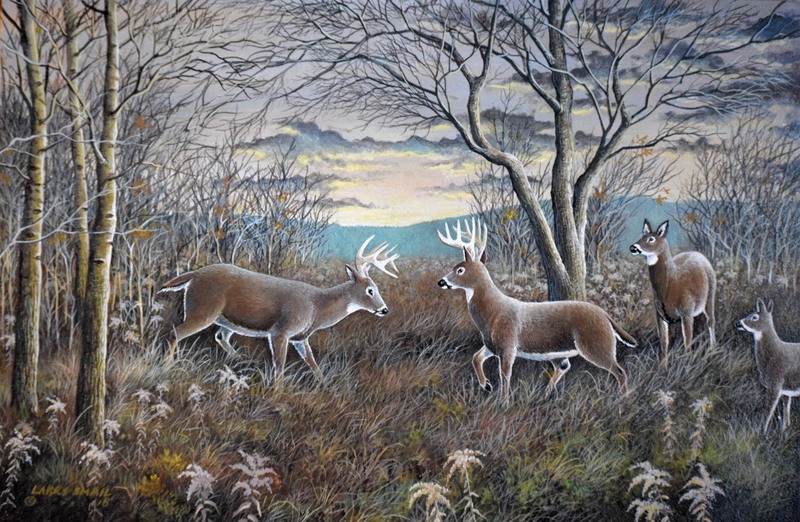 Eventually, I added a second doe. I hope you enjoyed this series of photos showing some stages with this painting. 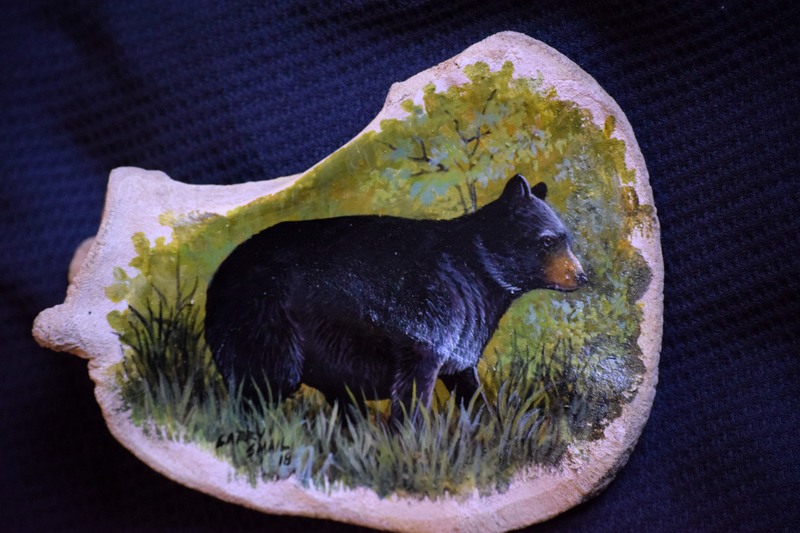 My most recent paintings on Black Bear bones: Contact me if interested in purchase. 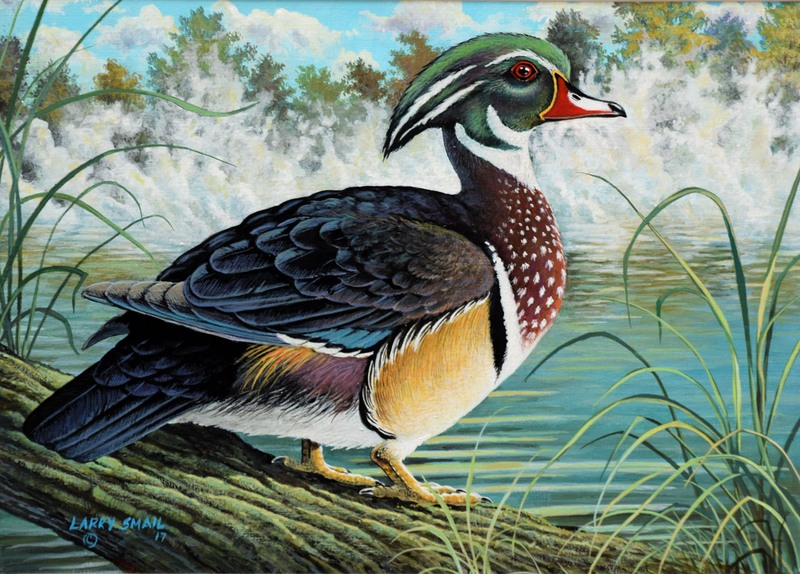 This recent acrylic painting features a male Wood Duck in all his splendor. I hadn’t entered the Pennsylvania Waterfowl Stamp Contest in a number of years for various reasons. However, this year I thought I would try another painting. My art wasn’t chosen. I hope you enjoy seeing the painting. Note my hand to demonstrate size of this scapula. After “slapping on” some paint. fifteen inches long and about ten wide at the widest point. 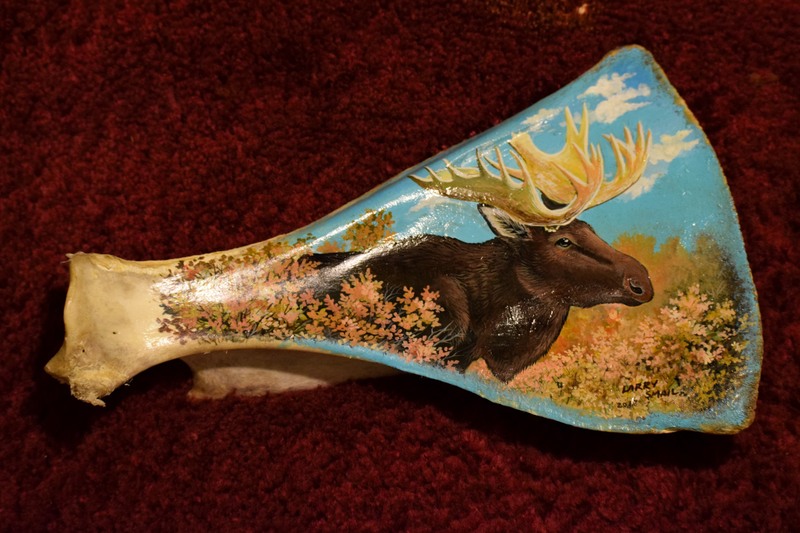 Obviously, I painted a Moose on this bone. 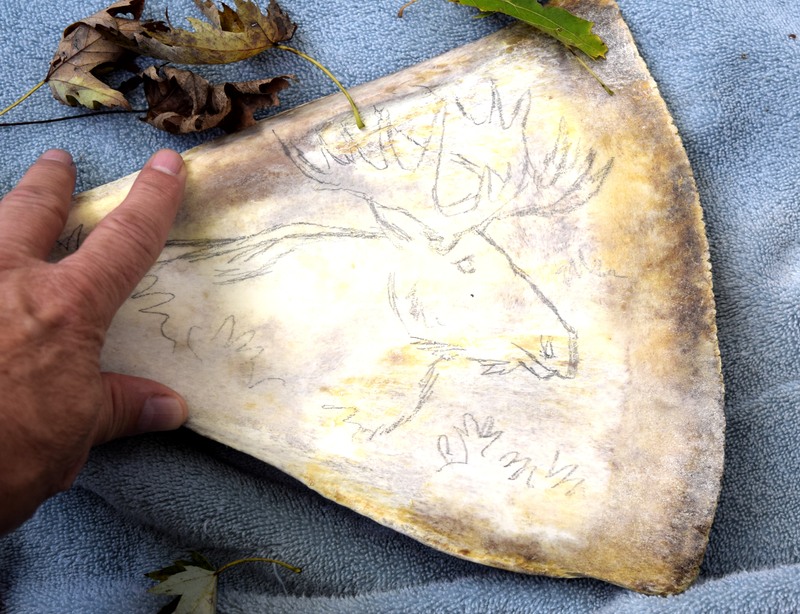 A rough sketch was drawn onto the bone to best utilize the limited space. Then the “slap on” stage began. At this stage I quickly slap the paint on to get the feel of the art and the direction it may go. The following step is the detail work followed by a coat of varnish. I hope you enjoy! 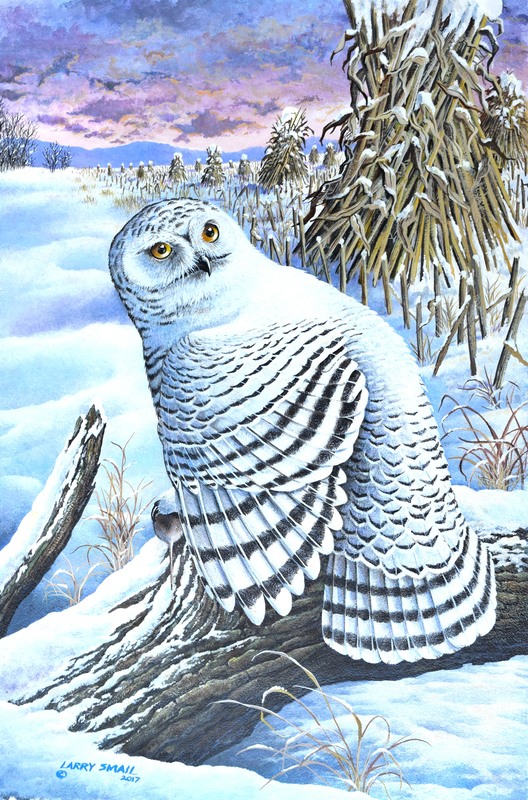 Earlier this summer, I completed an acrylic painting of a Snowy Owl. I painted the piece with hopes of being selected for a print. The painting failed. 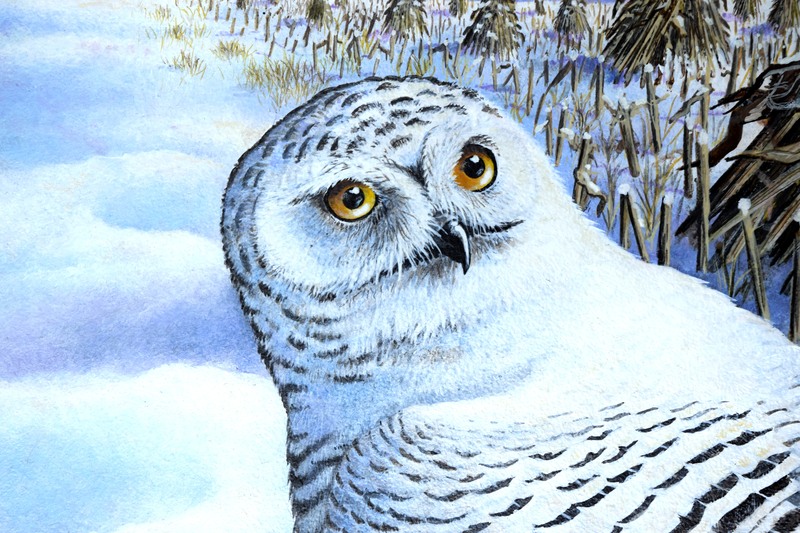 The Snowy Owl is a beautiful owl. I have never seen one in the wild since they very seldom drift this far south in my state of Pennsylvania. A few years ago one was viewed for a short time near my home. The bird was often spotted on a barn. So, for me I studied available photo images of the owl, before setting down and drawing a host of layout ideas. 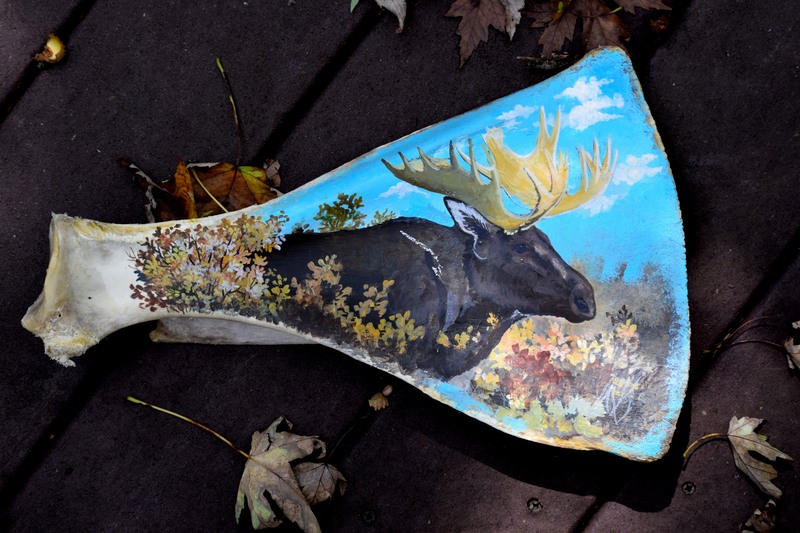 In fact the original concept occurred during the spring gobbler hunting season. I sat in the woods doing thumbnail sketches. I would choose from them several ideas that I liked. Following the final selection, I began doing bigger sketches until I came up with the image shown below. After I started this painting I went through a time of internal debate of the positioning. The idea is this owl has the wings dropped to hide the recent catch of a mouse. The tail is spread in a defensive mode. I wondered if this position would be understood for anyone viewing the painting. I have seen Great-Horned Owls do similar shows of defiance. I decided to leave the idea as is.